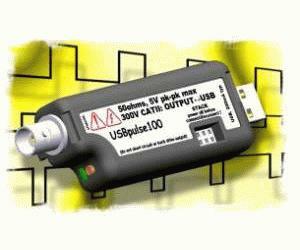 USBpulse100 is a new concept in USB Digital Pulse/Clock Generator products. PC based pulse generators deliver many user benefits including flexibility, ease of use and economy. They are an invaluable tool during design and debug of digital circuits and can be used to quickly test the behaviour of a circuit under different input frequency and duty cycle conditions. The USB interface has developed into probably the best and most widely implemented PC peripheral connection method and is a natural choice for the Pulse Generator. USBpulse100 combines very small form factor with high performance normally associated with much larger bench type products. Power for the Pulse Generator is provided via the USB interface connector, further simplifying the user experience. The output is galvanically isolated from the USB bus / PC ground meaning that pulse / clock signals can be injected differentially from the USBpulse100 into the circuit under test. USBpulse100 is small enough to be carried in a shirt pocket or laptop bag but uses a standard BNC connector.